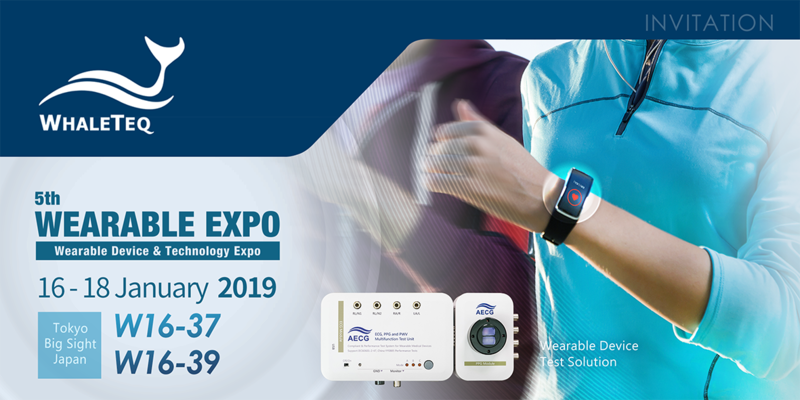 WhaleTeq sincerely invites you to visit our booth at Japan's WEARABLE EXPO. You'll be seeing our multi-function tester AECG100 at WhaleTeq's booth. AECG100 is mainly designed for wearable with ECG, PPG HRM, SpO2 and PWTT functions. With sufficient test parameters and user-oriented software interface, you'll be able to test your wearable with ease and confidence. We look forward to meeting you in Tokyo Japan! WhaleTeq has been working on ECG standard testing tools and solutions for years. Since 2013, more than 400 clients from 30 countries, whose domains include healthcare equipment manufacturer, OBMs and related certification laboratories, have adopted test solutions from WhaleTeq. WhaleTeq now co-works with J Business Service Corporation (https://www.j-business-s.com) for distributing products in Japan. Feel free to contact Mr. Ogawa of JBS (nogawa1955@gmail.com) or WhaleTeq service team (service@whaleteq.com) for further inquiries.